The H2Optx mPAT LAB hardware and MetaSuite software solutions provide scientists and engineers with a comprehensive view of the detailed chemical structures in a wide variety of pharmaceutical and fine chemical materials. H2Optx’s proprietary integration of Raman, optical & UV imaging and microscopy enables fast and accurate identification of the widest variety of compounds. This integration, combined with robotic native sampling accessories, allows for unattended scanning and analysis of tablets and large volumes of complex powders. H2Optx proprietary technologies are ideal for applications where the desire is to have high-resolution insight into raw materials, in-process materials, or finished products. The H2Optx mPAT LAB integrates Raman spectroscopy, UV & VIS light spectroscopy, microscopy, and hi-res optical imaging with automated X-Y-Z surface scanning. 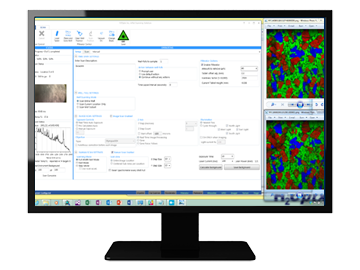 H2Optx MetaSuite proprietary software provides an integrated, end to end solution for processing the H2Optx mPAT LAB multi-spectral data. MetaSuite user-friendly programs provide meaningful structural & chemical analysis for both powders and solids (tablets) for the Pharmaceutical and Fine Chemical industries. H2Optx MetaScan provides a platform for easily performing fully automated 3D Raman, optical, and UV imaging of powders and tablets. H2Optx MetaAnalyzer processes raw Raman spectra and optical image data into descriptive 2D & 3D structural and chemical maps. These detailed maps provide deep insight into the underlying structures created during pharmaceutical and fine chemical manufacturing processes. H2Optx MetaClipper is a spectral “big data” exploration tool enabling the visual selection and extraction of individual spectra from 3D chemical maps – representing billions of spectra. H2Optx MetaCLI provides Windows® command line access to the MetaSuite family of powerful analytical tools. MetaCLI can be used for scripting advanced use cases. H2Optx MetaDiagnostics software provides “health check” capabilities for the mPAT LAB system ensuring that the system is always running at peak performance.